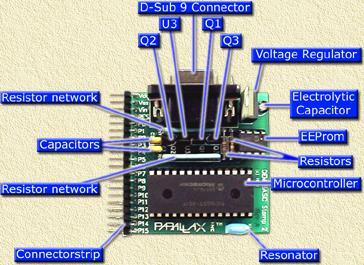 On this page you will find a brief instruction on how to assemble the Parallax OEM Basic Stamp II. Keep in mind that this is a VERY brief instruction based on my personal experiences. Read the disclaimer! Tip: You can also consider building your own HomeBrew Basic Stamp! When building the OEM Basic Stamp II kit, you should ALWAYS follow the instructions that came with the kit. This can be either a booklet or a CD-Rom. In case you have only a CD-Rom, then it's adviseable to either use the Parallax navigator (in the root of the CD-Rom: Welcome.exe - which autoruns if autorun is enabled on your PC). The dot, found on the resitor network end, should be pointing to the markings on the PCB "RN1" and "RN2". The manual mentions a pin identification but I could not find one on my PCB. I'm not sure if this is what Parallax had in mind, but anyway it worked for me (considering the setup of the resistor networks it will probably not matter how you orientate them anyway). Keep in mind that the 4 transistors are different! I used a simple powersupply that is already regulated to 5V. The purpose of Vdd is that if there is power available on the PCB this pin will output +5V as regulated by the LM2940 power regulator. You could use this to hookup a LED (Light Emitting Diode) to indicate that the BASIC Stamp is powered. Avoid overheating by using proper soldering equipment. When mounting the sockets for the chip do this without the chip inserted! First solder the socket, once cooled down insert the chip. Press one side of the chip gently on a flat surface, this way the pins on one side of the chip are bend equally. Repeat this for the otherside too. Remember to do this GENTLY. The resistors used are 4.7K Ohm (Yellow, Purple, Red - and Gold band). Resistors are polarity insensitive, which means that it doesnt matter which end goes where. Install the resistors on the PCB identified by "R1" and "R2". The side with the bend pins should be inserted into the pcb. Install the strip header on the PCB identified by "X1". Two 0.1 uF ceramic capacitors (little brown components with 2 pins) are used. Like, the resistors, it doesnt matter which way these are installed. Install the two capacitors on the PCB identified by "C2" and "C3". The resistor networks look like little blue mini combs. The dot, found on the resitor network end, should be pointing to the markings "RN1" and "RN2" on the PCB. In the image on the right, the red arrow indicates the orientation notch. The blue arrow indicates pin 1. To make things a bit easier: For the IC sockets that you will be installing, there is a notch along the outside edge of the board on one of the short sides. Match this notch with the notch printed on the PCB on the locations "U1" and "U2". The ceramic resonator, a brown or blue component with 3 pins, is polarity insensitive. It doesnt matter which way it is installed, it will still work OK. Install the ceramic resonator on the PCB at the location called "XTAL". The electrolytic capacitor looks like a small cylinder with two long pins on one end. The electrolytic capacitor will have the negative lead marked with one or more - signs. Install the leg NOT marked with the - signs in the hole closest to the + sign in the "C1" space on the PCB. - First install the Reset Supervisor; it looks like a black knop with three legs and bears the mark, "13811". The white silkscreen on the pcb will guide you as to how to orient this component ("U3"). You will need to bend the middle pin slightly to get it to fit. - There are three other components that closely resemble the Reset Supervisor. Two of these have the same marking "3904" and should be placed on "Q1" and "Q2" on the PCB. For these two to fit you will need to bend the middle pin too. - The last remaining look-a-like is "Q3", marked "3906". Install this transistor in a similar fashion on location "Q3". Now install the 9-pin D-Sub connector. This looks like it will plug into a serial cable. There is no way to plug in backwards. The last component to solder on is the voltage regulator, "VR1". It is a black plastic square with a metal tab protruding from the top. Install this with the metal tab closest to the 9-pin D-Sub connector. This component is polarity sensitive and MUST be installed correctly. The voltage regulator makes sure the power supplied to the Basic-Stamp is not exceeding the 5V limit.